Successful women from UNB in various roles and stages in their career have been selected for publications celebrating International Women’s Day. Canada Foundation for Innovation highlights a new generation of Canadian women researchers in their #IAmInnovation campaign for International Women’s Day. 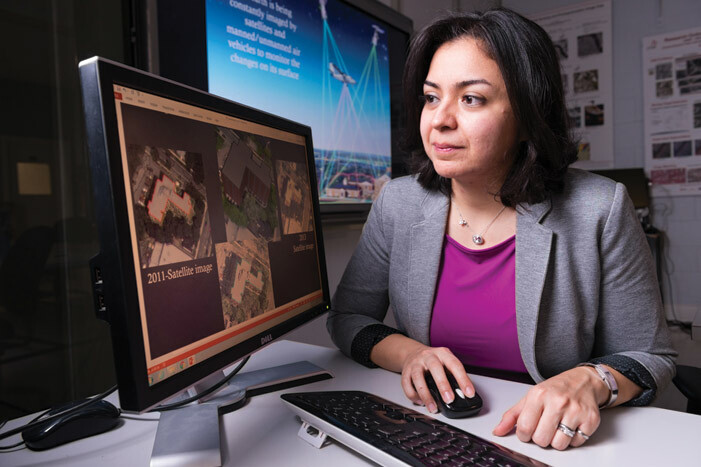 Dr. Shabnam Jabari, assistant professor of geodesy and geomatics engineering, is proof that women can rise to the top in traditionally male-dominated sectors. In the commentary section of The Daily Gleaner, Ms. Silke Brabander, associate director of the Muriel McQueen Fergusson Centre for Family Violence Research, states that dedicating resources to prevent violence against women and children today will save the province money in the future. UNB master’s student Britta Sennewald and PhD candidate Samaneh Mahdavifar of the Canadian Institute for Cybersecurity are showcased in CyberNB’s Women of New Brunswick’s Cybersecurity Ecosystem in support of the federal government #InnovateForChange campaign. In celebration of International Women’s Day, The UNB Art Centre will be opening its exhibit, Illuminations: Contemporary Silver Candleholders Honouring Canadian Women in the Arts. The exhibit will highlight 15 award-winning Canadian metalsmiths featuring contemporary silver candleholders that honour Canadian women’s past, present and future. The exhibit opens at 5 p.m. on March 8 and runs until May 3. Admission is free to members of the public. Everyone welcome. The University Women’s Centre is bringing people from all over the Fredericton community to create art with an underlying theme of women, diversity, and inclusion. There will be paintings, drawings, and even some poetry. The art show will take place from March 11-13, 9 a.m. to 5 p.m. in the downstairs atrium in the Student Union Building. Renaissance College will be holding an art exhibit Justice for the 56 girls of Hogar Seguro, Guatemala to commemorate the tragedy of 56 women and girls locked in a burning room at a state-run centre for children and youth on March 8, 2017. This art exhibit features prints of original portraits dedicated to the victims in different media, contributed by different artists globally. The exhibit opens at 5:30 p.m. on March 15 and is on view until March 21. For more events happening in the community, please visit the Women’s Equity Branch event page.